Easily create your event floorplan diagram using AllSeated’s collaborative planning tools. In the process of creating your event floorplan diagram, give your entire team the benefits of collaborative planning tools which provide both operational efficiency and an organized working environment. Invite clients to collaborate as well as your vendor team to keep everyone operating on the same page regarding all details related to the event. Easily customize your event floorplan diagram to-scale to reflect the needs and vision for each event! Did you know that in the United States, one in every ten event floorplan diagreams are created in the AllSeated platform? For this reason, most venues already have their event floorplan diagram templates uploaded in AllSeated’s system. If your floorplan templates cannot be found, you can provide us with a floorplan marked with at least one accurate dimension and our team will scale it and upload it into the platform. Using AllSeated’s furniture library, select the specific tables, furniture, and objects you wish to use to create the event floorplan diagram. AllSeated’s floorplan tools give you the option to control the spacing between tables, the number of chairs around each table along with table numbers and table assignments. All of these details can be modified at any time while designing your event floorplan diagram. At any time while designing your event floorplan diagram you can switch between 2D viewing and 3D viewing. AllSeated’s 3D viewing options, both Bird’s Eye view and 1st Person view, allow you to create a virtual walk through of your event. You can now build tabletop and buffet displays to-scale within your event floorplan diagram. Watch this quick video for a great visual! The designer tools allow you to see exactly what can fit to-scale on tabletops — No more guesswork! The table builder and buffet designer tools currently include options for place settings, flowers, centerpieces, linens, and buffet pieces, with many more objects to come. AllSeated’s guest list provides your client with tremendous added value. Within the account permission settings, you can allow your client access to manage their guest list AllSeated and also easily seat their guests. Guest names and mailing addresses can be entered and organized alphabetically, even filtered into specific categories based upon your event’s needs. Guest names can be entered manually or imported from Facebook or Excel. Within the guest list section, keep notes, store meal type requests, and track RSVP’s too. The guest list also allows for tracking guests and running reports in real time. AllSeated’s guest list features a direct link to seating. Clients can seat guests efficiently at the tables that are positioned in the event floorplan diagram. Easily drag and drop guests at the desired tables within the floorplan. There is also the option to seat guests at specific seats at specific tables if desired. It’s easy to play around and move guests from table to table. Experience an event before it even happens! AllSeated’s special virtual reality goggles allow you to virtually tour your 3D event floorplan diagram in a realistic simulation. Learn even more about Virtual Reality in this video and the three easy steps for getting started here. AllSeated VR is the event industry’s first and only genuine virtual reality capability. AllSeated’s VR technology provides 360 diagramming which will send your customers customers on a virtual walkthrough of your venue regardless of where they are in the world. 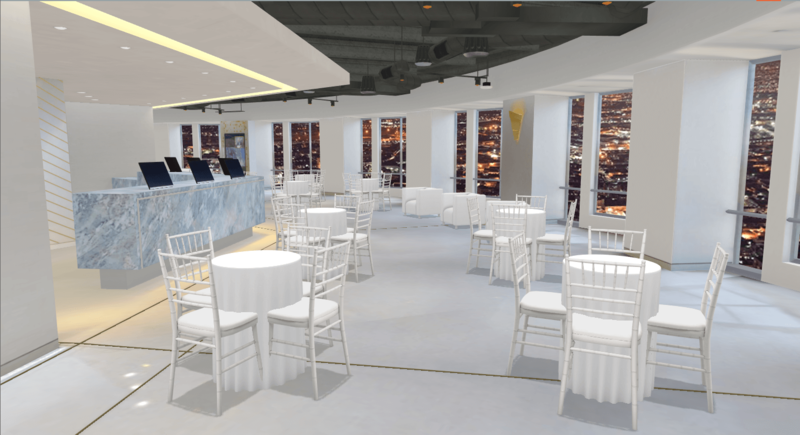 Clients can now tour the venue in 360 degrees, preview their tables and furniture within an event floorplan diagram, and even view a custom setup in virtual reality, achieving full immersion into your venue months before their event takes place. Learn more about AllSeated’s VR in this video!